At the axis of Michael Nerheim's successful 2012 campaign was a promise to create a case review panel. Four months after he was elected Lake County State's Attorney, Nerheim selected the first five cases to send to his case review panel. Four of the cases were felonies. One case, the Chicago Tribune reported, was Vince Testa's. The only misdemeanor case is that of Vince Testa, who was convicted of battery and resisting arrest after a January 2010 confrontation with police at his home outside Libertyville in which he was shocked with a Taser on video camera. The footage shows the altercation that followed Lake County sheriff's officers' attempts to serve an arrest warrant on Testa's son. The Chicago Tribune article had two significant observations. The first observation was that none of the cases that Nerheim selected involved DNA evidence. The implication was that without DNA evidence, none of the cases were likely to be overturned. The Chicago Tribune also observed that along with three murders and a sexual assault, Nerheim chose to review Vince Testa's misdemeanor conviction for resisting arrest. One reason is that on December 3, 2012, Testa petitioned Nerheim to review his case. 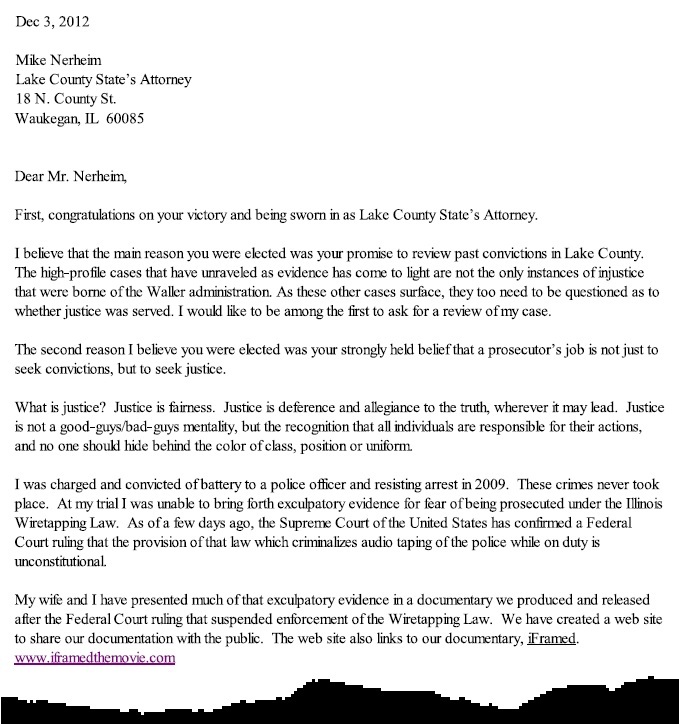 As I posted on this blog, in iFramed, there is compelling video evidence to believe that Testa was, to use an old fashioned term, railroaded by the Lake County justice system. The video evidence to this effect is available on Testa's website, which is also called iFramed. One of the main reasons we made the documentary was because we had a story we wanted to share with our fellow citizens in Lake County. We wanted our pain and frustration to serve as a warning to others so that they might protect themselves from what we have experienced. [...] Through telling our story we have been contacted by others who have had similar pain and grief, to varying degrees. Their reputations have been ruined, their spirits broken, their faith in our country shattered. Despite only being a misdemeanor case, Testa's would have had the potential to be another high-profile embarrassment for the office of the Lake County States Attorney, and would probably need to be dealt with quickly. There is no question in my mind why Nerheim selected Testa's misdemeanor conviction as the fifth case to send to his review panel.